In the musical hall stands Petko Staynov’s piano from the 1920s. 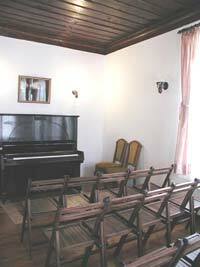 The hall is intended for performances by small and chamber orchestras, as well as for music lessons. 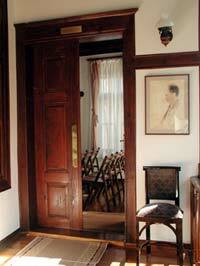 It has 25 seating places; opening the door leading to the vestibule increases its capacity to 30 places. The use of the Musical Hall for music lessons by the schools from the town of Kazanluk and for rehearsals of amateur musical groups during the Home’s working hours is free. The use of the Musical Hall for music lessons by the schools from the town of Kazanluk and for rehearsals of amateur musical groups outside the Home’s working hours entails the payment of certain overhead expenses, subject to agreement. The use of the Musical Hall for for-profit activities, such chamber concerts with admission fee, meetings and discussions, music lessons by private teachers, master classes, and other events, paid for by the participants, presentations of books, etc., will be charged according to the price list below. Oct. 16 – March 31 Use of Petko Staynov’s piano Use of the audio system with user’s cassettes or disks. The use of the Musical Hall and the common premises for the organization of exhibitions is subject to agreement.